When Samsung announced Galaxy Tab as an iPad killer in September, the Samsung tablet becomes a hot topic. However, the tablet does not come out in expected released date (October, 2010) through T-Mobile, Verizon, AT&T or Sprint. Recently Verizon planned to sell the 7-in Samsung Galaxy Tab on Nov. 11 at $600, while T-Mobile offered $699 plan for Samsung Galaxy Tab. The prices are higher than the $499 Apple iPad via AT&T. It may hit some observers, but the Android 2.2 Froyo with Flash support is attractive point for Android lovers. Even though there is competition between Samsung Android Galaxy Tab and Apple iPad, just like the Samsung Galaxy S to Apple iPhone 4, you can also connect Galaxy Tab to Mac computer for transferring videos from Mac computer to Samsung Galaxy Tab without using iTunes. Samsung Galaxy Tab includes full HD (1080p) video player and records 720x480 at 30fps. From the listed supported video and audio format, Samsung Galaxy Tab actually supports many videos and audio. However, if you have videos in different formats like TiVo, MTS/M2TS, TP, TS, MKV, VRO, RMVB on your Mac computer, the videos could not play on Galaxy Tab. Aunsoft Video Converter for Mac is the recommended Mac video to Samsung Galaxy Tab converter for you to convert TiVo to Galaxy Tab, MKV to Galaxy Tab on Mac OS X like 10.6 Snow Leopard, 10.5 Leopard and 10.4 Tiger. Have a look at the step-by-step guide below, you will find it useful to convert videos to Galaxy Tab and transfer Mac videos to Samsung Android tablet. Step 1. 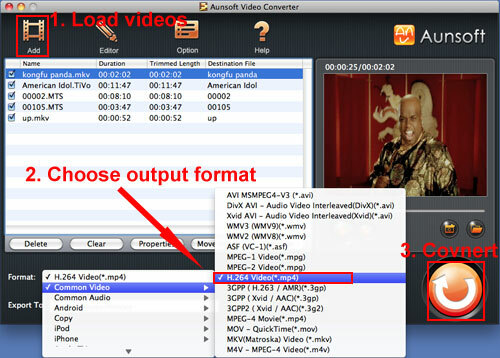 Load videos to Aunsoft Video Converter for Mac. Run Aunsoft Video Converter for Mac as the best video to Galaxy tab converter on Mac computer, and click the "Add" button to browse the videos in various formats including but not limited to .tivo, .mkv, .mts, .m2t, .m2ts, .rmvb, .rm, .vro. Step 2. Choose output format for Galaxy Tab. Click the "Format" option, and navigate the mouse cursor to Common Video, you will find many output formats. As Samsung Galaxy Tab supported many movie formats, you can choose either .mp4, .mov, .avi, .or wmv as output format for the Samsung Android tablet. Step 3. Convert videos to Galaxy Tab on Mac. Click the convert button under the preview window, and the Mac Galaxy Tab video converter will start converting videos to MP4/WMV/AVI/MOV for Samsung Galaxy Tab with best quality. Configure Port Mapping by taping on Galaxy Tab like Home > Menu > Settings > Applications > USB Settings > Mass Storage, connect Galaxy Tab to Mac computer with USB cable and tap the Mount button on Galaxy Tab. Then you can transfer Mac videos and music to Galaxy Tab in ease. For transferring and ripping Blu-ray movies and DVD movies to Samsung Galaxy Tab, just try Aunsoft iMedia Converter for Mac to enjoy all movies on Samsung Android tablet.